yukikau toshi mo mata tabibito nari. Days and months are the travellers of eternity. The years that pass are also but travellers in time. His tour took him over 2400 kilometers on foot! It took him five years to complete his report of this walk. It includes 51 hokku and is not a simple diary, but a work of literature, including fiction and philosophy. He visited many "poetic pillows", uta makura 歌枕, famous places where poets before him had been visiting and writing poetry about. While he was thus travelling the road of former famous poets like Saigyo, he was also travelling along his own life, even toward the future. He lived in a time when the age of 50 was considered a good time to die!
. Barnhill : the concept of MUJŌ . fuga no makoto is a result or product of the dynamism of two colliding forces: fueki ryuko, which is another important teaching of Basho. Fueki simply means "no change" and refers to values of a permanent and enduring nature. For instance, Beethoven created new and innovative music, ushering in a new age and setting a new trend. However, he did not do so without first having been steeped in classical music of an old tradition. Thus he had fueki ryuko and left legacy of permanent value. None of us is Beethoven, but all of us can become a little Beethoven! Fueki ryuko is an abbreviation of senzai-fueki ichiji-ryuko (eternal no-change and temporary fashion). When fueki and ryuko collide and interact in a dynamic explosion of creative haiku writing, the result could be like a newly born baby taking after both parents but different from both. And there is a single ultimate value that lies beyond fueki ryuko, and that is nothing but fuga no makoto. Basho edited the haiku presented in "Oku no Hosomichi" according to the rules of RENKU, including moon, cherry blossoms and two about love. The last ku of a linked verse is "ageku　挙句", and there is a popular Japanese proverb, ageku no hate 挙句の果て, at the last ku, meaning "at last". The walk starts in Edo. in 1689, taking final leave from his friends.
. Yuku haru - spring is ending .
. Urami no Taki 裏見の滝 - 裏見の瀧 Waterfall .
. Gennō Shinshō 源翁心昭 Genno Shinsho . The priest who smashed the "Murder Stone" in 1385.
. WKD : 遊行柳 (ゆぎょうやなぎ ) Yugyoyanagi . One of the famous "utamakura" places of Basho's travel. The tree has been re-planted many times over the years, but the atmosphere is still very much that of the Edo period. Every time you count them, you get a different number. Quite possibly Basho has tried to count them too ! from here the Road to the North finally starts. Two shrines at the border to the Northern Territories. One on each side of the frontier line. On the inner side a shrine for the female deity (Tamatsushima Myojin 玉津島) to protect the interior. On the outer side a shrine for a male deity (Sumiyoshi Myojin 住吉) to protect from enemies of the outside. Travellers in the Edo period used to pray here for a safe trip and gave thanks after a trip was finished.
. waka sanjin 和歌三神 three great Waka deities, . The local daimyo Matsudaira Sadanobu had a stone memorial built in memory of this frontier gate about 100 years after Basho passed the area. Matsudaira Sadanobu was Lord of this castle. Lord Matsudaira (1759 - 1829) was well liked and did a lot for his people. He built the first park for commoners in Japan, the famous South Lake Park, Nanko Koen (Nankoo Kooen) 南湖公園 .
. WKD : Iio Soogi 飯尾 宗祇 Iio Sogi . Paper clothing was used by poor peasants to keep warm in winter. Basho might have used one of these warm robes from Shiroishi. The real author of this haiku was ????? Matsushima is one of the three most beautiful secnic areas of Japan. Basho followed in the footsteps of the tragic fate of the warrious Yoshitsune and Benkei (chinkon no nen 鎮魂の念) with this visit. He might also have used the travel to explore and find the depth and tragedy of his own being. Takadachi 「高館(たかだち) at Hiraizumi was a castle that Fujiwara Hidehira had built for Minamoto Yoshitune. The "Shining Hall" is the golden mausoleum of three generations of the Fujiwara Clan. The rain of the rainy season has fallen on it for more than 500 years when Basho visited. The changing of heaven and earth is the heart of the nature spirit in haiku. Catch the changing of nature and you have what you need to write true haiku. Entering into Dewa, Dewagoe 出羽超え. The walk over the steep pass takes more than 3 hours. Basho hired a young guide to make sure he would not loose his way. From the top of the pass you can see Mount Gassan in the background. Safflower, saffron flower (benibana, beni no hana) . 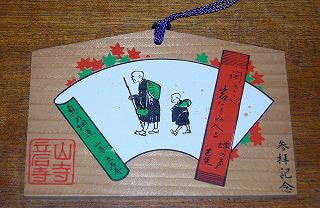 Farmers wear a specially shaped straw hat, called "natagiri なたぎり(photo) , in the shape of this pass. This is one of the few hot springs near a silver mine. The workers used to go there and heal their wounds or just rest and relax after the hard work in the mines. Basho might have stayed there to rest after crossing the pass, before walking on to Obanazawa. now famous for its Shogi 天童将棋. The Three Mountains of Dewa used to be part of a famous pilgrimage, representing LIFE (Haguro), DEATH (Gassan) and NEW BIRTH (at Yudono). "As I sat reflecting thus upon a rock, I saw in front of me a cherry tree hardly three feet tall just beginning to blossom - far behind the season of course, but victorious against the heavy weight of snow which it had resisted for more than half a year. I immediatley thought of the famous Chinese poem about 'the plum tree fragrant in the blazing heat of summer' and of an equally pathetic poem by the priest Gyoson, and felt even more attached to the cherry tree in front of me. " At Mt. Gassan, Basho saw the Mountaintop Cherry blossoms, minezakura 嶺桜. They flower much later than the ones down in the valley. That is why on Mt. Gassan you can experience the three ingredients of Japanese ascetics, Snow, Moon and Cherry blossoms, (Setsugetsuka, Setsugekka 雪月花) at the same time. Basho went on to Mt. 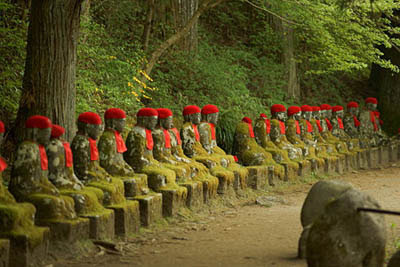 Yudono, where it is forbidden to talk about your experiences there. I visited there many years ago. He changed this later and this is the official haiku now. The original haiku has a kigo for summer, kaze kaoru. Basho visited the temple in early summer, June 4th. Yudono is a very sacred plate for the Godess of Dewa. shoes and walk around the rock of the gods without talking. How cool it is here. My sleeve is with tears. Basho's companion on the way. Kisakata is a superb place to take a leisurely countryside walk. Kanmanji is surrounded by a sacred grove of old-growth laurel trees (tabunoki たぶのき【椨】 Persea thunbergii or Machilus thunbergii).
. YAMAGATA - On the path of poets . 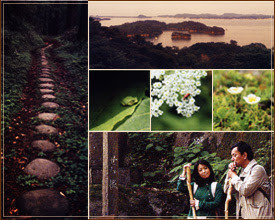 Izumo saki, Izumozaki 出雲崎　is the birthtown of priest Ryokan. The difficult part of this journey, Oyashirazu 親不知　(not minding your parents) and Koshirazu (not minding your children) , refers to an area along the coast between Niigata and Ichiburi where the mountains are right to the sea shore with their sheer cliffs. The waves drone against the base of the cliffs and the only way to get past this is to wait for the moment when the waves receede and then run for your life ! Kurikara means 'black dragon' in Sanskrit. CLICK for some photos here ! Visit to the Shrine Kehi Jingu　気比神宮 with a haiku about the moon. Basho's travel with the wind (kaze no tabi) ends here in 1689. Sora, who had left Basho earlier on the trip, had hurried to Ogaki to gather many haiku friends to celebrate the goal of the travels of Master Basho and make this a memorable ending of the long tour. into this autumn . . .
. discussing : futami　二身 - 蓋身 two bodies . Beckoned by the cloud-scattering winds and Dōsojin, the male-female guardian god of the road, longing to see the moon rising over Matsushima, Matsuo Bashō (1644-1694) left Edo for Oku at the end of spring in the second year of Genroku (1689). Travels along the path of Matsuo Basho, Japan’s 17th-century haiku master, help bring his words to life. Haiku by Matsuo, Basho, from "Narrow Road to Oku". Dr. Donald Keene has generously given to me his permission to use his translation of the Basho's haiku. 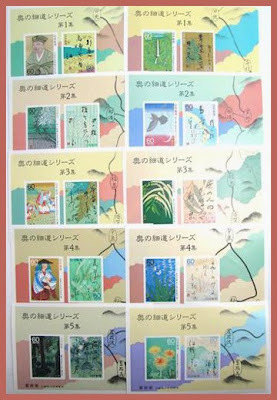 I will be showing my haiga of all the haiku in "Narrow Road to Oku"
Stamps about "Oku no Hosomichi"
. The Narrow Road to the Interior .
. Michinoku, Mutsu 陸奥 region in Tohoku . Barnhill's literal translation of 'yuujo' is "play-girls." "The courtesans, or prostitutes, are 'yuujo　遊女'. And it is hard to know　how to translate the word. For an account of the distinctions　between 'maiko' (apprentice geishas), 'geisha', and 'yuujo', see Liza　ｄalby, 'Geisha', Berkeley; University of California Press, 1983. Geishas were trained in the arts and in social graces, 'yuujo' in 'toko no higi　床の秘儀', the techniques of sexual pleasures." "If Basho is developing his narrative [of The Narrow Road...] along　the lines of a linked verse sequence, he may have wanted to insert an　episode dealing with love here. A linked verse sequence would be　expected to have such an episode. Basho shifts his scenes from　mountains to rivers to valleys to forests and we would also expect him to insert episodes dealing with love, flowers, the moon, etc. Basho describes for us a variety of natural settings and intersperses　certain human encounters. At Nasuno it was a charming and innocent　little girl, at Kisagata it was lady Seishi he is reminded of to　enrich the mood of his narrative. It is not surprising then that　along the Echigo Road he chooses to include an encounter with　courtesans. 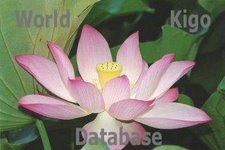 The element of love is also in play here in his earlier　references to Lady Seishi and then to the Tanabata festival, and now　he speaks of commercial love. This is reinforced by his allusions to　The Tale of Genji and to the Wakan Roei Shu and to Eguchi Yujo. Indeed, Basho seems to be parodying Saigyo's experience with the　courtesans at Eguchi." Here is an account given by the commentator Yamamoto of Saigyo's experience with the courtesans of Eguchi, translated by Ueda in his book, "Basho and His Interpreters:"
to lend a temporary shelter? According to what I imagine, special food was 赤貝(akagai),ark shell, which tastes very delicious. That is because of the name of 虫甘満寺(Kanman ji), the Kanman-Temple. “The first Kanji character ‘虫甘’ means ‘赤貝(akagai), ark shells”, says the dictionary of Kanji characters. ‘満’ means ‘filled’ or ‘full’. So the area was filled with delicious ark shells. It is also said that there were various kinds of shell eaten in those days. Thank you so much, Hiruta San !! Issa doesn't mention smoke in his haiku, but I believe it is implied. The smoke rises in an upright fashion, appropriate to the charcoal-making kiln of the "Buddha" Gohei. Issa is parodying "Gozae" with his "Gohei."